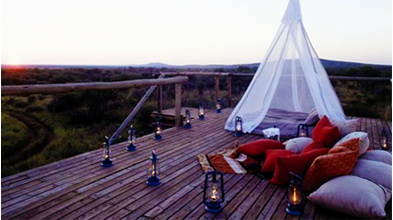 You are living in the middle of the wild of South Africa. 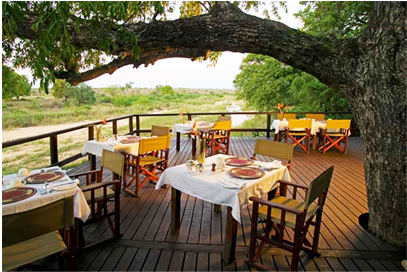 You are enjoying a panoramic view of green tree and wild animals from your private balcony. You are feeding a wild animal from your room window. You are relaxing and drinking fruit juice while hearing birds singing or a lion roaring. Your imagination will come true with MyQ Resort – a five-star resort designed in unique African style in Vietnam. MyQ Resort with African Style in middle of city is the great combination between relaxing and exploring. MyQ Resort provides a relaxing and private experiment for customers. You will be pleased while staying at MyQ Resort because of services and facilities qualified five-star standards, including: comfortable king or queen size with soft mattress, spacious bathroom equipped rainfall shower or platform bathtub with wooden walls and trees surrounding, large window with panoramic views of the wild in MyQ Safari. You don’t need to go out for dinner or exercise, all that things can be done inside MyQ Resort. MyQ Resort has elegant restaurants, beautiful coffee shops and impressive bar. You can enjoy various kinds of food including Vietnamese traditional food, Italian food, European food, etc. If you want to experience the surprise, you can choose some fresh ingredients available and the experienced cook will prepare dishes from your chosen ingredients right at your table. If your daily routine always has exercise, you can come to MyQ fitness service, MyQ tennis court, MyQ swimming pool or require a yoga coach. You never feel bored while staying at MyQ Resort because MyQ Resort has provided some entertainment services. You can joke around the lake, come to fountain squares and enjoy the music and water show. You can sing better than ever with modern digital karaoke machines in MyQ karaoke rooms. You can challenge each other on MyQ’s billiard tables. Most of African animals such as hippos, rhinos, lions, etc. hunt or forage for food after sunset when the temperature is cooler. 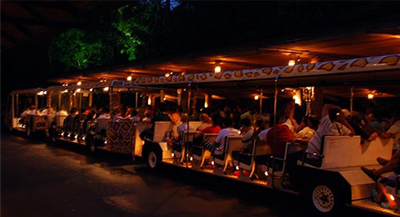 If you book to stay at MyQ Resort, you can join Night Safari tour – a tour organized at night to discover night life of wild animals in MyQ Safari. You will experience an exciting and adventurous tour in MyQ Vietnam and MyQ Safari by tram. The 30-minute tour begins with wild cat – bear area and finishes after visiting Rhinos area. The tram will stop at each area and a tour guide will give some interesting information for customers. With herbivorous animals, you can feed them with specific food prepared by the tour guide. After the tour, you will enjoy a highland cultural performance with ethnics. 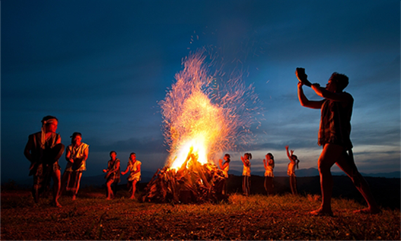 You will gather around a campfire, listen to traditional ethnic music, dancing and drinking “ruou can” – a traditional wine of ethics. MyQ Resort is the first and only place in Vietnam organizing Night Safari Tour. Let’s come and experience! Are you looking for a unique idea for your special day? Do you think organizing wedding ceremony in a restaurant is so common? 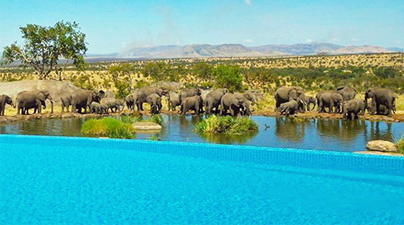 If MyQ resort suggests you organizing your wedding party in the wild with wild animals and decorating in romantic and wild style, what do you think about MyQ special wedding idea? Let’s imagine that you are wearing a gorgeous wedding dress, holding your beloved’s hand under the night sky full of stars, exchanging your wedding rings with candlelight and shimmering lights around and riding a big elephant to a romantic wedding room after the ceremony. It’s unique and romantic, isn’t it. These are only a few things among many surprises MyQ resort prepared for you. 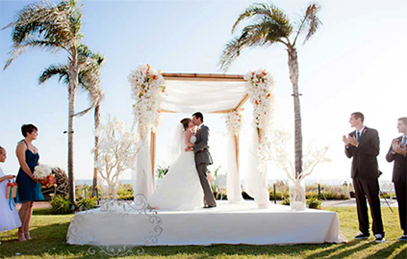 You can set up your wedding at fountain squares in a windy afternoon or on the artificial seaside at twilight. 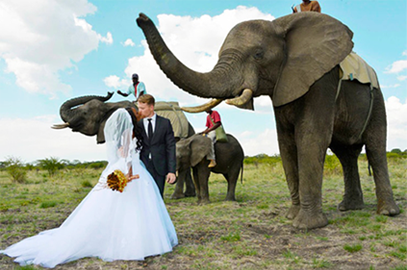 You can have unique wedding photos with animal models in MyQ Safari. Your wedding can’t be perfect without a passionate wedding room so MyQ Resort will decorate your wedding room as you requested, such as romantic violet, passionate red, adorable pink,etc. With MyQ Resort, your events will be different. 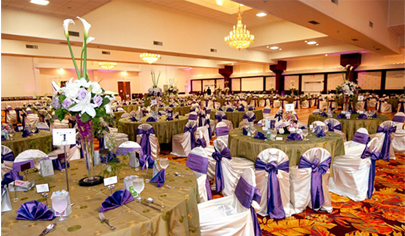 You can establish a luxury indoor event or an unique outdoor event. MyQ resort has various kinds of convention hall which is for 100 guests or up to 500 guests. 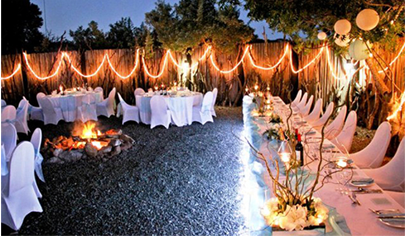 Outdoor events are suitable with intimate parties or creative meeting. Your events will be organized successfully with modern sound system, decoration and outdoor buffet or cocktail service of MyQ Resort. MyQ Resort will give advice and cooperate with you to turn your ideas into reality in the most effective way. Trust MyQ and MyQ Resort will bring a memorable event for you and your guests. 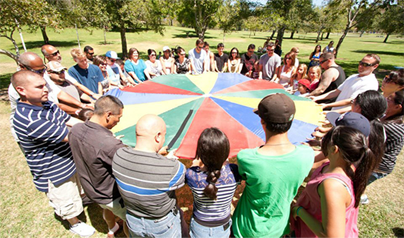 Are you looking for activities for your team-building events? Do you want to experience the “super athletic” feeling through difficult challenges? Do you like to challenge your brain with hard puzzles? MyQ Resort has various challenges included indoor and outdoor activities. 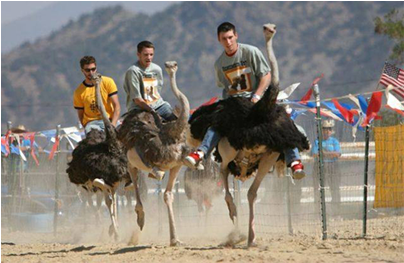 With MyQ Resort, you will have excited and adventurous moments that you never forget. For example, there is a treasure hidden in MyQ Resort, you have to find hints to discover the treasure. You might chase a chicken to take the hints on his leg or you might take part in an ostrich relay race or you might row a big basket into middle of a lake to pick a floating hint, etc. In addition to the games organized by MyQ, you can make your own game. You present your ideas and MyQ will help you to prepare tools or places for your games. You never regret when choosing MyQ to organize your team building events! Partners will be directly involved through design stage, construction stage, business and management stage. MyQ Safari will support you with space and other services in order to help the cooperation processes in the most favorable way. MyQ Safari always welcomes the potential partners who have more than 5-year experience in each sectors and interested in this cooperation opportunity to contact us. Conditions and benefits are depended on the particular circumstances. 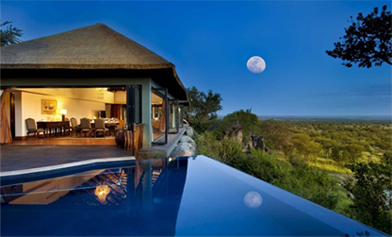 For more information, please contact MyQ Safari.